If you see your city, or one nearby, on the map at right, you could come visit me for $20 round trip. Seriously. Of course, you'll have to pay to check your bags or to have a beverage or snack (you can even pay $10 to board before the commoners! ), but pack light and eat before you board and you're good. 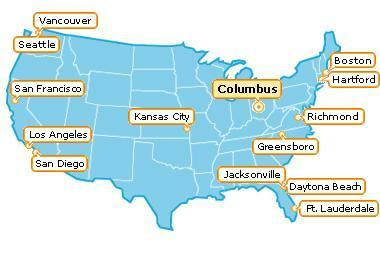 Skybus is a new Columbus based airline with at least 10 seats on every flight for $10 each way. Other tickets are $20-$30, still a good deal. Brand new planes and all non-stop flights too (as long as you're either coming to or leaving Columbus). It's a good time to live in Columbus. So close, yet so far. By the time I drive to KC, I've spent $80 in gasoline. Drat. I could use lunch. I'll still come to Columbus one day, anyway. Well, comic con is coming soon, and the flight is the main thing that is stopping me. Do you know when this deal stops? Now, if only they would lower the price to get in! That last linc didn't make it. The web address for comic con is www.comic-con.org/ For some reason, when I try to make the link, I get spam filtered. Comic con is an amazing experience. Even if you go once, you'll remember it for the rest of your life. But, bring money. San Diego is expensive, and comic con can be. My favorite thing to do is to get graphic novels that the creators self publish and you can't find them in bookstores, have the creators sign them, and then take them home and have them forever. Awesome! You gotta love those creators that are getting their stories out at their own expense, just to let it be seen. It is also a great time to get about 15 to 20 lbs. of free stuff, no joke. I'm going to turn off the built-in spam filter. I've got another anti-spam plugin installed that's doing all the work. All the built in one is doing is catching legit comments like yours accidentally. Checked bags. $5 each for the first 2, $50 after that. Priority Boarding. $10 to get on after the special needs folks, but before everyone else. On-board food. From $2 for M&M's or a Pepsi to $10 for Martini & Rossi Asti Spumante or a box lunch. And don't bring your own food! And the $10 doesn't include airport fees and taxes up to about another $10. And as the plane fills up, the price goes up. I checked prices for the dates of Comic Con and it's $100 each way. In fact, there's nothing under $50 each way as far out as you can book (mid December). That almost sounds too good to be true. Almost makes it worth the drive from Cincinnati to Columbus, though. I guess it looks like Los Angeles is the closest drive for me: 11 hrs. Milly's man works for the airlines Milly always uses that one. Dude! You rule for looking that up. On the Comic Con web-site they have local hotels and room rates. It will cost about $1000 to stay all week at one of the hotels listed, cheaper one's that is, plus food, plus the price of the convention itself. BUT, I am telling you, you will never forget your trip to Comic-Con!